As an RAC Partner Dealer we have undertaken to prepare all our vehicles to RAC Partner Preparation Standards. This includes an 50 point pre delivery inspection. We will service any vehicle appropriately where due. Because modern vehicles are machines and can sometimes go wrong we include RAC Warranty and complimentary RAC membership for your peace of mind within the windscreen price of every eligible vehicle*. RAC Warranty provides you with the additional security that should your vehicle experience a mechanical failure or breakdown RAC are on hand to minimise your inconvenience and personal cost. RAC Warranty allows you to use any VAT registered garage in the UK for repairs and will also pay for unexpected mechanical failures should you decide to take the car into Europe for your holidays. 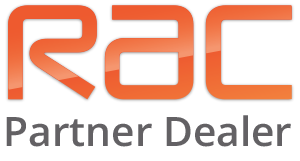 As an RAC Dealer we are proud to offer RAC Membership with every warranty. This membership covers the vehicle for Roadside Assistance & Vehicle Recovery 24 hours a day 365 days a year. The RAC are the worlds' oldest motoring organisation and have more patrols per member than any other motoring organisation. RAC Platinum Maintenance & Breakdown covers ALL Mechanical & Electrical components for failure to perform their normal function. Platinum Maintenance & Breakdown is available for vehicles up to 10 Years with less than 120,000 miles at inception. RAC Gold Maintenance & Breakdown covers specifically listed components for failure to perform their normal function. Gold maintenance and Breakdown is available for vehicles of any age and any mileage.